I'm new to this board and I'd like to present here the latest updates from my label & mailorder ZHELEZOBETON. The mailorder update features a lot of Russian editions this time. There are new works by such projects as Dom Vdovy, Nubiferous, Kaztalien, CDs and a t-shirt by a long-standing Siberian project Liholesie, a cassette with the archive live recording by Dm. Zubov (Hypnoz) and G. Avrorin on a new label Secretly Chuvashian, a vinyl record by Alexander Selivanov (ex-Mortart), two new cassettes by Lunar Abyss (collab with Kromeshna and split with System Morgue), new hi-end CD-R from Kshatriy with recent live material, CDs from St. Petersburg's minimal improv label Intonema and cassettes from Spina!Rec. Also worth mentioning are the new CDs from Aquarellist label: the latest album by Rapoon in both standard and collector's editions, and the album by Dale Cooper Quartet & The Dictaphones side-project called Noroeste. We also got some new discs from the nice Slovak electro-ambient label Aliens Production, some records from the American Helen Scarsdale Agency and a whole collection of rare Russian industrial releases from late 90-ies - early 00-s found by our long-time supplying partner, including early releases by such labels as Ultra, Ufa Muzak, etc. (sorry, but their prices are not for the faint hearted!). Thank you for your attention, gentlemen! Distro updates feature CDs from one of the most currently active European labels Zoharum (Poland), new split-CD by Russian ambient acts Lunar Abyss and Vanum, latest vinyls from the Estonian martial / folk label Fronte Nordico, some author's (re)issues by Kirill Stoukalin (Organomehanizm, ex- Reductio Ad Absurdum) and paintings by the Siberian artist Vitaliy Maklakov known for his projects Kromeshna, Light Collapse, Obozdur, etc. With this update once again we start the traditional winter sale. If you order ten or more items marked by the sign [-50%], you buy them for half-price. Some of the items listen in the rare / used list, lightened by green colour, may also be bought with the discount. - worth mentioning is the new label from St. Petersburg specializing in dark minimal techno / experimental music - La Notte Di Architetto with three cassette releases. This kind of techno we enjoy indeed! - plus new recordings from such projects as Lunar Abyss, Stuzha, Monocube, Nigdeniya and more! Just to remind you - we still have this winter sale where you can order 10 or more items from the disto catalogue marked with a [-50%] sign, and have them for half-price. Sale also refers to some items from the rare & used list (marked green). We'll keep the sale running until next update, approximately in early or mid-March. Spring finally pervades our minds and bodies, vital forces wake up from hibernation and prepare to bloom in full power. Just take a look at a concert list for the coming month - at least a couple of gigs every weekend! 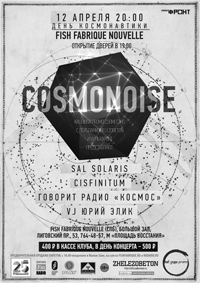 One of the most important events for us is the traditional COSMONOISE festival, which is going to happen on the Day of Cosmonautics - April 12th. This time it will feature performances by two Moscow-based projects - CISFINITUM and SAL SOLARIS, - who play in St. Petersburg quite rarely. A company for them is provided by the ever-present psycho navigators GOVORIT RADIO "KOSMOS" and the visual magician VJ Yuri Elik. If you're somehow around, try not to miss! But this is only in a month. And now we have gathered some amount of new releases from local labels, such as Still*Sleep, Eternal Return Records, Infinite Fog Productions, Spina!Rec, Intonema, new album by Rapoon on :retortae: label, reissue of a classical Muslimgauze album on Aquarellist, new releases by Lunar Abyss + Ogni Videniy, Zinc Room, and a bit of second-hand items. Looks like this is the first catalogue update featuring more new cassette releases than those on CDs! Russian scene is presented by the new releases and some reissues from the Rostov-based label Observatoire; we also got a pack of cassettes and vinyls from the Moscow-based Bookwar Records; plus new albums from the projects YAO 91404 D and Voluntary Torture. A couple of new CDs we got from the Ufa Muzak label. We also got almost the complete catalogue by the French label Les Nouvelles Propagandes (La Nomenklatur, Minamata and more), fresh stuff from the Lithuanian Terror and American Helen Scarsdale Agency. Like always, our distro catalogue has been updated with lots of musical oddities and rarities of all kinds. Russian underground never sleeps! We got new items from NEN Records (Stpocold and Sal Solaris + Heinali cassettes), Frozen Light (Astrowind, Moloch and more), Operator Produkzion / YAOP, BioSonar^Lo-End, Semperflorens, Observatoire, Spina!Rec, Intonema, Aquarellist (extended reissue of Rapoon's "Tin of Drum"), Chernaya Zemlya, plus cassette version of the latest album by Reutoff "No One's Lullabies" in exclusive packaging. We also got the series of compilations from the German label Chamber Music, a collection of releases from Thomas Beck's (tbc) label Wachsender Prozess, from the Italian imprint Naked Lunch Records, reissue of the classical album by Yen Pox & Troum "Mnemonic Induction" on Transgredient Records and 3-LP set by Trepaneringsritualen on Retortae. Autumn promises to be intense. Stay with us, listen to the right music, be good bunnies! Six new releases again! More info here and here. The mailorder catalogue was updated by some stuff from the Russian scene - the new works by Lunar Abyss, YAO 91404 D, cassettes by Reutoff and Cisfinitum, releases by such labels as Spina!Rec, Operator Produkzion, Bookwar Records, Frozen Light and Aquarellist. The international scene is represented by the new long-awaited album of the dark German romantics November Növelet, plus new releases from the Italian label Silentes and Japanese SSSM. We also started our traditional winter sale featuring about a thousand titles from the catalogue. The terms of sale are still the same - when ordering ten or more items marked by the sign [-50%], you can buy them for half-price. Some of the items from the rare / used list, marked by green colour, may also be bought with the discount. First mailorder update for this year - and quite massive one! About 150 completely new items and about a hundred more previously sold out items back in stock. We're pleased to present the new releases from the Russian labels Frozen Light, Observatoire, Post-Materialization Music, Nazl&oslash; Records, Ksenza Records, Dronarivm, BioSonar, Nadeln Prod. + such projects as Sistema Bezopasnosti, Corvuz and Six Dead Bulgarians. The international scene is presented by a serious block of releases of the German underground label Attenuation Circuit + new stuff from Cold Spring (including new albums by Troum and Z'EV), Slovakian electronic wizards from Aliens Production, Polish martial forgers Rage In Eden and Ur Muzik, and from some other labels like Drone Records, Helen Scarsdale Agency, SSSM and :retortae:. Our winter sale is still in action! If you want to supplement your record library with a weird music for nice price - now it's the right time to do it! The action will continue until the next mailorder update in March. Two new releases: Sal Solaris "Thresholds" CD + Church Of Howling Dog "Umbra" CD ~ more info here! Record collectors may be interested in vast additions to our rare & used list. Aside from that we have a massive mailorder update with new releases and restock from our friend-labels: Autarkeia (Lithuania), SSSM (Japan), Gradual Hate Records (Spain), Dark Vinyl (Germany), Cold Spring (UK), The Ceiling (Canada), Valgriind (Russia), plus really fresh stuff from Russian labels NEN Records, Ufa Muzak, YAOP, Polevoy Dnevnik and Noyade Records, and huge amount of various other items with affordable prices! Please keep in mind that many items we have only in single copies, so don't hesitate to make an order or ask for reservations! Mailorder update features titles from such labels as Galakthorrö (Germany), Reverse Alignment (Sweden), Force Majeure (France), Les Nouvelles Propagandes (France), Aliens Production (Slovakia), Twilight Records (Argentina) and Russian imprints Aquarellist, Operator Produkzion / YAOP, Frozen Light, Dronarivm, Infinite Fog Productions and Intonema. We keep faithfully providing your stereo systems with new portions of drones, noises, strange tunes and atmospheres! Sixty-fifth ZHELEZOBETON release is the album by the St. Petersburg based project Kryptogen Rundfunk. In fact, this is the project's first big studio work in the past 12 years. The album is based on the live program performed in 2013-2016, and the last live versions of this program will be presented during the Baltic Tour in Latvia, Estonia and Finland on October 10th-15th, where Kryptogen Rundfunk goes with the label mates Neznamo and Uhushuhu. This time the mailorder update is not so large - due to lack of time, mostly spent on preparation of the new release and organizing the tour. Nevertheless we got some releases from the labels 213 Records (France), Frozen Light (Russia), Cold Spring (UK), Malignant Records (USA), Drone Records (Germany), as well as many other varied CDs. Baltic Tour starts on Monday and will last for a week, so the mailorder will be closed from October 9th to 16th, but the new update with many more specialities and fresh ZHELEZOBETON podcast is scheduled for the end of October - early November. Stay tuned! Page created in 0.175 seconds with 19 queries.